'Siege of Ladysmith - a Bird's-Eye View', 1900. 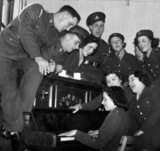 Soldiers and ATS girls at the piano, Fort Crosby, March 1940. 'Sir Admiral Bertram Ramsay', c 1943. Thomas Edward Lawrence (1888-1935), September, 1934. Russian Jews with British soldier, Jerusalem, c 1925. 'Gorka's Rifles. Mussoree Bataillons', c 1858. Nurses putting gas masks on wounded German, 1914-1918. British soldiers wearing gas masks, 1917. GI brides admiring new stockings and shoes, 17 December 1945. A car in a bomb crater, Bristol, 1941. 'Supports going up after battle...', c 1917. School children being evacuated from London, 28 September 1938.